This week served up news splash by Facebook forum «Bike People» calling for support rally regarding Vao Village folks protesting against refugees. The forum, Tsiklirahvas in the original Estonian, is no organisation but an entertainment oriented web group traditionally posting pictures of motorcycles, videos, and fun. In Facebook, Estonia has others of like kind, such as Mootorratturid, Eesti Mootorratturid etc. Alas, the political initiative featuring extremist rhetoric stigmatises all and everything related to biking. Whoever dons a helmet gets labelled – the charities, the lady-riders, the unsuspecting enthusiast and what not. 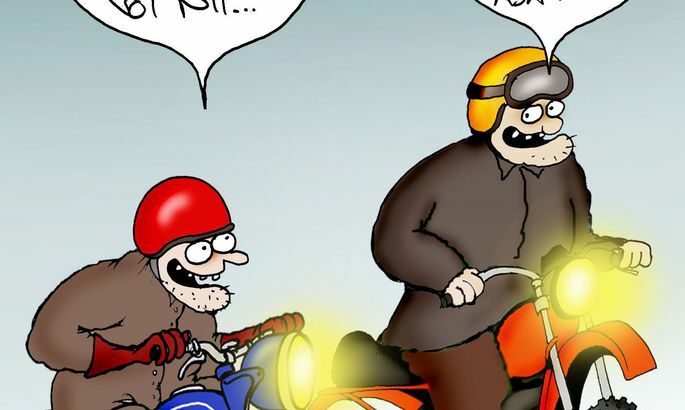 The up-to-now totally apolitical biker events like Jõgevatreff will be forced into defence – otherwise, their current shape and form is soon history. Sensing the threat, Estonia’s major related Internet forum Biker.ee shut down the topic on event planned. The bikers are a motley crew – from students to politicians to just... bikers. The thing is bikes and nothing else. Occasionally, a stand is taken regarding traffic safety, say. Riding motorcycles is a hobby, a lifestyle. A way to fellowship. Some ride track, some do cross country. The talk is mostly about the roads, the traffic manners, or the gear. The political link, however, promptly pops a hybrid war type issue. Like a banner pulled above the entire bunch. By the many who answered the call, this seems to go unnoticed, misunderstood. But the issue is broader yet. Though a niche thing itself, the bikers circle still comes with its ever-present peripheries. Like Bandidos, Hell's Angels. And now the Night Wolves in Russia. Still, to a degree larger or smaller, these guys are glaringly marked and the link to the common biker is no closer than between a village folk trio and The Jimi Hendrix Experience.